It would not be an exaggeration to say that this weekend was the most fun, cultural filled and activity packed of the year so far. I guess it is quite obvious that by trying to do all-the-things we would end up missing some (or like my mom used to say: "El que mucho abarca poco aprieta", something along the lines of "Jack of all trades, master of none"). It is also kind of obvious that at some point I would have some kind of meltdown. On Saturday night, after dinner, there was a moment where I'd had it, and all I wanted was to collapse on my bed, immediately. 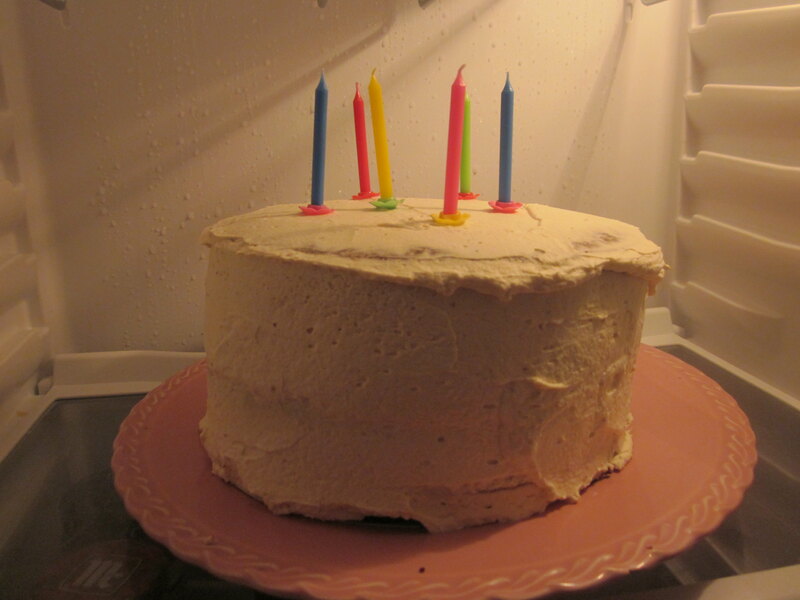 This weekend was the boy's birthday, so I spent Friday baking him a huge american-style birthday cake. My original plan was to cover it in fondant, but as the mascarpone frosting was delicious (and fondant - covering requires only a very thin layer), I decided to keep it simple. I used Ainhoa's wedding cake recipe, and it was so absolutely delicious (thank you Ainhoa). I only tweaked it by adding a pinch (well more of a pinch) of cinammon to the icing, because I just love to go crazy with it. 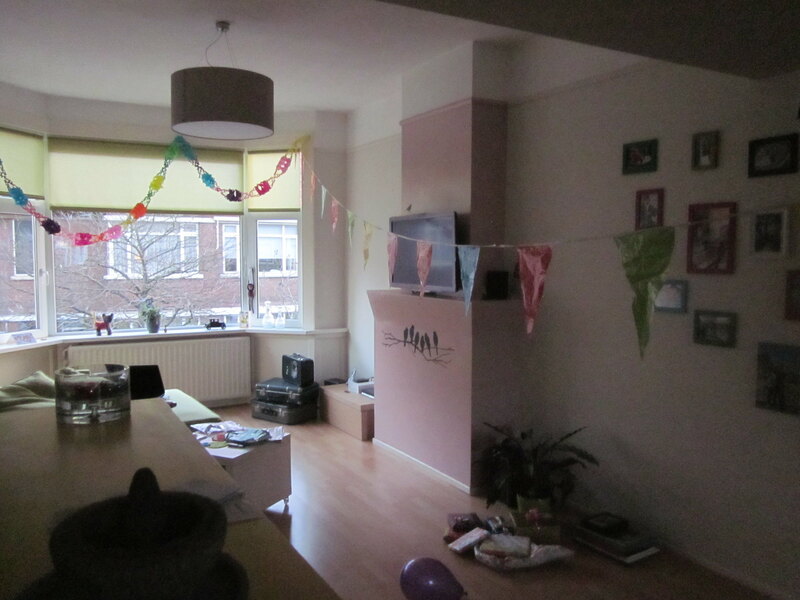 Early on Saturday morning I woke up to decorate our apartment with car-sale bunting, balloons and garlands. Making a huge big deal of birthdays, including decorating all the house, is starting to be a tradition in our family. I made him his favorite breakfast (omelette) and gave him his presents (a tiny stack of books: he got this one and this one). Our dear neighbours (the ones with the young kids we babysit every now and then) are moving to a bigger house, and they asked us to take care of their 3-month old baby on Saturday, while they moved furniture out, which we were more than thrilled to do. I had made a reservation for high-tea in Amsterdam, but helping out and hanging out with the cutest little girl was for sure the best option. In the afternoon the boy's closest family came for tea, cookies and cake, and then we went for dinner at the Penthouse, a super fancy restaurant at the top of a skyscraper where you can enjoy the views of The Hague (well, because this country is so flat, you could see as far as Rotterdam). On Sunday morning, we went to the airport to drop off mom-in-law, who is heading to sunnier latitudes, after which we went grocery shopping and cleaned the house in turbo mode (the boy vacuumed cleaned, while I trailed after him, and mopped), and then we set off to the American Book Center for a lecture by Professor George Saliba on the relationship between Science, the Arab / Islamic world and the European Renaissance. 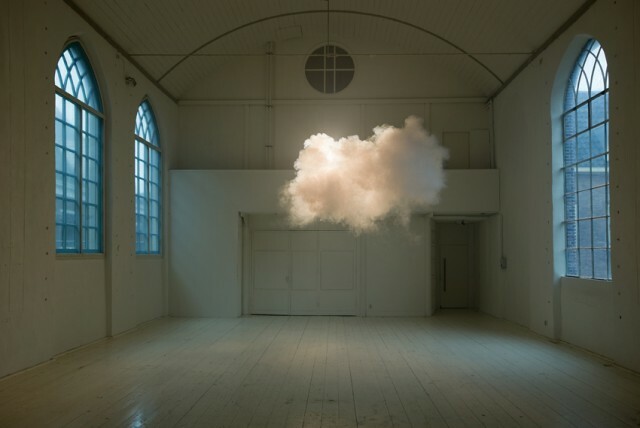 After that we rushed to catch a cloud, that is, watch how artist Berndnaut Smilde manipulated the temperature and humidity conditions in a closed room to create a fluffy ball of air. Alas, we missed it. The Q&A after the conference took a bit too long (and we could not just leave in the middle of it), and when we arrived at the art center, barely 15 minutes late, the cloud had just dissipated and all we saw was some steam still floating in the air. As a consolation prize I got a bunch of postcards with a photo of the magic phenomenon. I only hope I will figure out where he will do it again, but he's a Dutch artist, so it should be possible. 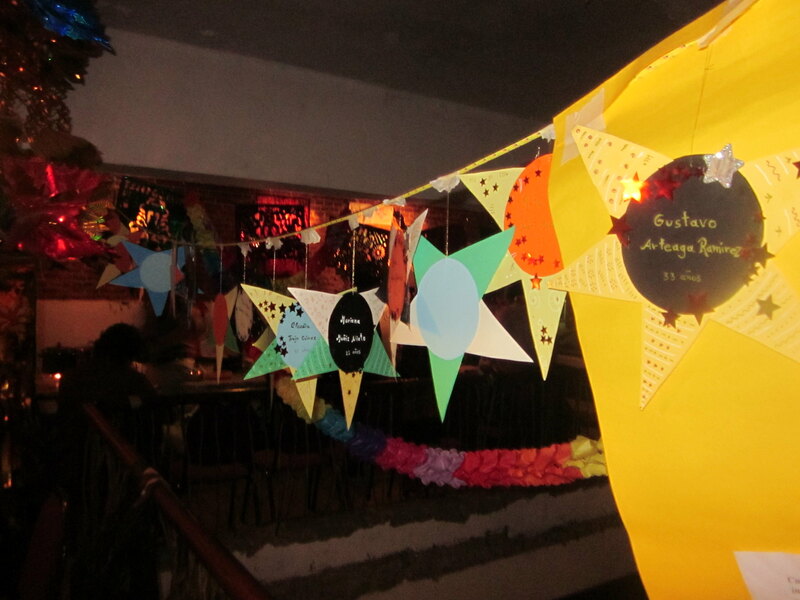 Last but not least, after missing the cloud we drove back to Amsterdam for an authentic Mexican Posada party. A posada is a Christmas party that takes place everyday for 9 days starting the 16th of December, and ending on the 24th, representing the 9 months of Mary's pregnancy as well as the pilgrimage of the Holy Family on the days prior to Jesus' birth where they travelled asking for lodging (the word "posada" means accomodation). I just found out this is yet another sincretic tradition starting in the 16th century and combining Spanish Catholicism with the December Aztec celebration of the birth of Huitzilopochtli. 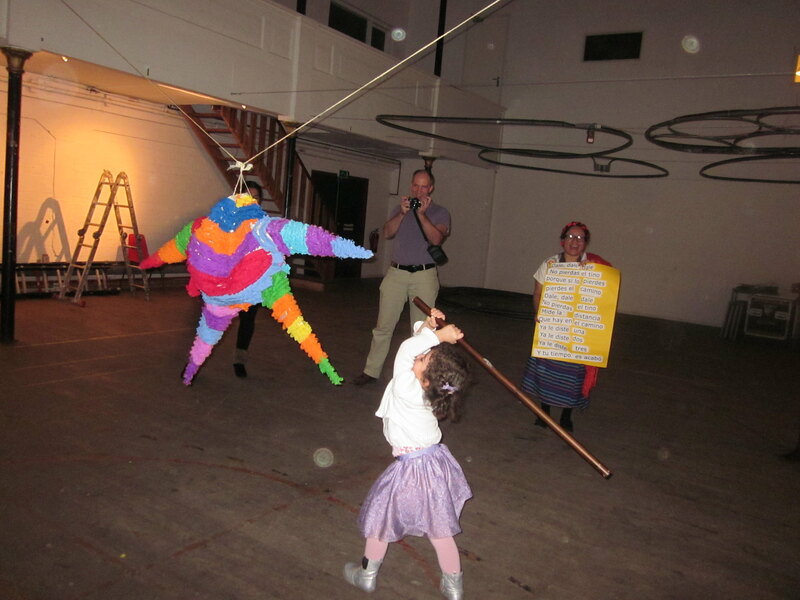 In these parties typical mexican food is served (there were tacos dorados, tamales oaxaqueños and tlacoyos); piñatas with 7 points (representing the 7 capital sins) are destroyed by hitting them with a stick to release their fillings: normally candy and fruit (oranges, mandarins, sugarcanes, jícamas). During the party 2 groups are formed, one goes outside, carrying a small Betlehem, representing the pilgrims (the holy family) asking for lodging, and the second group stays inside, pretending to be the hosts, and repeatedly refusing to let them in until they recognize it is Joseph and Mary, by singing this song. I was so happy to attend (I had not ben able to go to a posada in a very long time) and to be able to show a very Mexican tradition to the boy. How was your weekend? Me alegro de que te saliera bien y te gustara! Parece que habéis pasado un fin de semana fantástico. Es el pastel perfecto... esponjoso y húmedo, y el sabor del mascarpone con las frambuesas lo equilibran. Y sí... fue un buen fin de, aunque ayer estaba exhausta. Oops, espero que hayas encontrado tu visa. Desde que ví lo de la nube me atacó la curiosidad. Yo hace mucho tiempo que no iba a una posada (aunque en Enero sí que rompimos una piñata nadamás porque sí. Y es que no me podía perder la comida mexicana, y recuerdos de infancia. Yes, I had the same reaction, it is somehow fascinating. (And yet is science, which is why I love it). Qué lindo fin de semana! Esa nube me intriga muchísimo, y qué hermosos el restaurant y la casa de té! No conocía las posadas, jamas habia escuchado hablar de ellas, y la verdad que el sincretismo Mexicano es una de las cosas que más me fascina de tu pais...qué belleza! Todo sea por la manipulación de las masas, la iglesia católica es experta en mezclar las tradiciones / dejar a la gente creer lo suyo dentro de un nuevo contexto. Pero es verdad que de la mezcla de tradiciones tan íntima que se dio a través de los siglos surgió una riqueza cultural enorme. Es algo que no sucedió por ejemplo en Estados Unidos y me parece que tampoco en Argentina (donde la población tiende a conservar las tradiciones de manera más "europea"? Pero tal vez me equivoco=. La vista del restaurant era impactante, teníamos ganas de ir desde hace tiempo y a la mamá de Mark se le ocurrió la idea. Nosotros también estuvimos primero impactando, y luego discutiendo sobre la masacre, entre lo que comentábamos del tema del sistema de salud, y el acceso a las armas... es de terror. Lo siento tanto por las familias y amigos, profesores. Hola, sí fue muy divertido, aunque el lunes estaba cansadísima. Me alegro que pudieras ir a una posada, son fiestas "diferentes", bueno, muy típicas por allá, y claro, llenas de recuerdos de infancia.